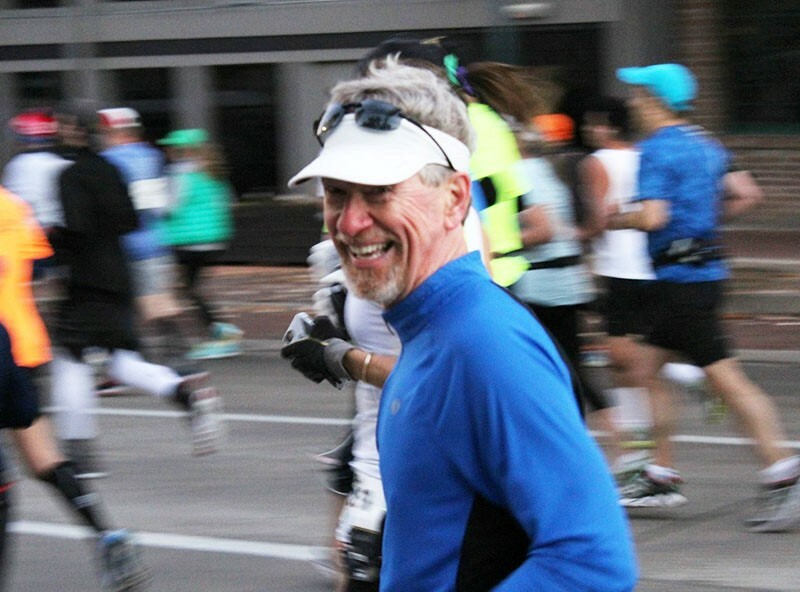 Bob McDowell is all smiles during a past Houston Marathon. 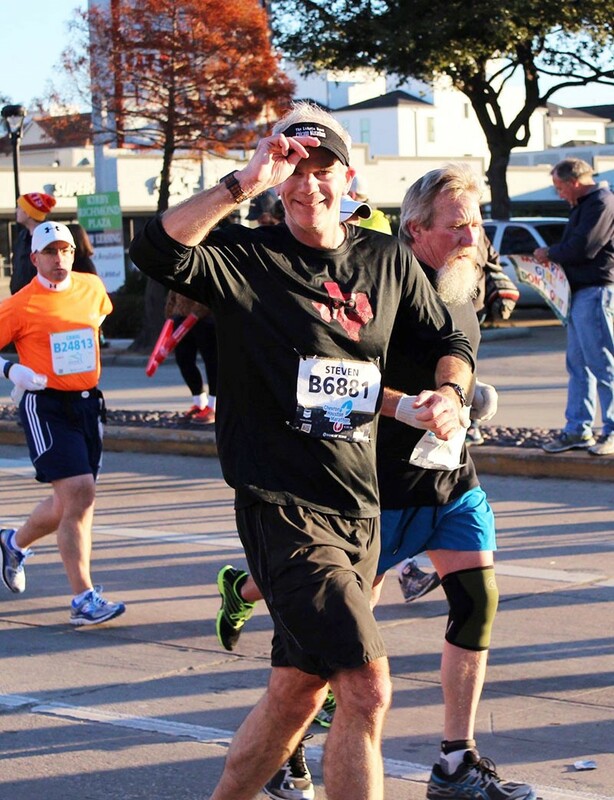 He ran his first Houston marathon in 1986 and the 2019 race will be his 33rd race. Bob is part of an elite group of only 15 other people with the streak of running the Houston Marathon more than 32 times. Steve Howard, a West U resident, ran his first Houston Marathon in 2004 and this year’s marathon on Sun., Jan. 20 will be his 14th race. Because he’s run 10+ Houston Marathons, he’s part of the Legacy club. The Houston Marathon and Half Marathon Legacy Program is made up of runners who have successfully finished 10 or more Houston marathons or 10 or more Houston half marathons within the official race time limits. According to the marathon website, these finishes don’t have to be consecutive, but all finishes must be in the marathon or half marathon event exclusively. Steve Howard tips his hat at the camera during a past Houston Marathon. Steve shared some of his memorable moments along the route over the years. 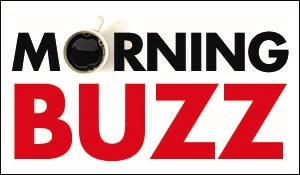 He said, “My all-time favorite experience was a few years ago when George Bush, surrounded by his Secret Service team, was sitting in his wheelchair outside of St. Martin’s Episcopal Church in Memorial waving at everyone and offering encouragement. It was an honor to shake his hand and I thought it was so special he took the time to be out there. I believe he had been an avid runner earlier in his life.” Steve also loves that Palmer Episcopal on Main and University has a priest out front blessing runners during the race. He has run marathons in other cities over the years but thinks the Houston Marathon is one of the best in the country because it’s very organized and the people are really friendly. 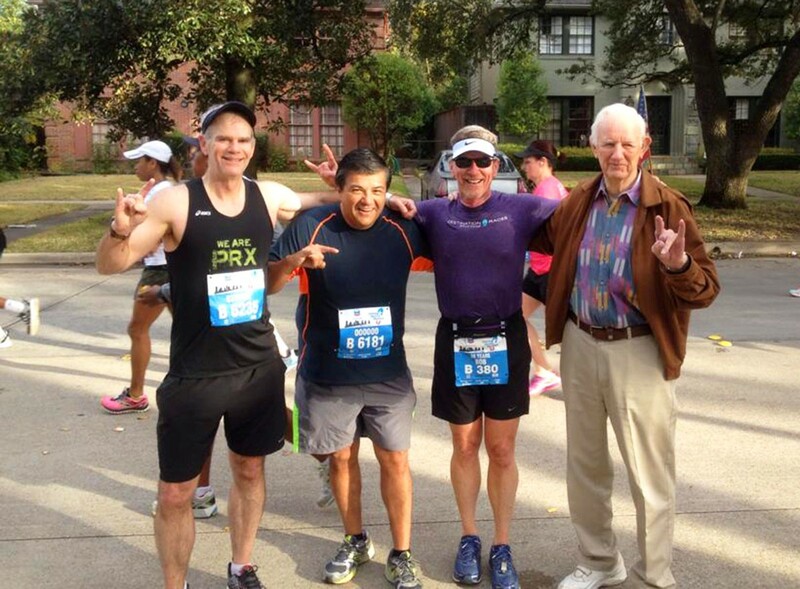 (From left) Steve Howard, Oscar Rodriguez, Bob McDowell and Carter Howard (Steve's father) proudly showing their "Hook 'Em Horns!" and taking a pit stop for a photo op during a past Houston Marathon. This picture was taken during a West University neighborhood portion of the route. Some of Steve’s running friends and fellow Legacy Runners include Robert “Bob” McDowell, Jack Browder and Oscar Rodriguez. Bob ‘s first race was in 1986 and he has run 32 consecutive Houston marathons, which is the current 14th longest streak for the marathon. Jack Browder ran 33 races from 1979 – 2011. He was also a pacer for many years. And Oscar Rodriguez has run 14 times since 2005. The guys can’t have all the fun. A few Legacy Ladies include Lee Newick, who’s run in 15 races since 1996, and her running buddies, Carolyn Galfione with 17 Houston Marathons under her belt and their friend, Mila Neal, who is only one marathon away from being a Legacy since her grand total is “only” 9. 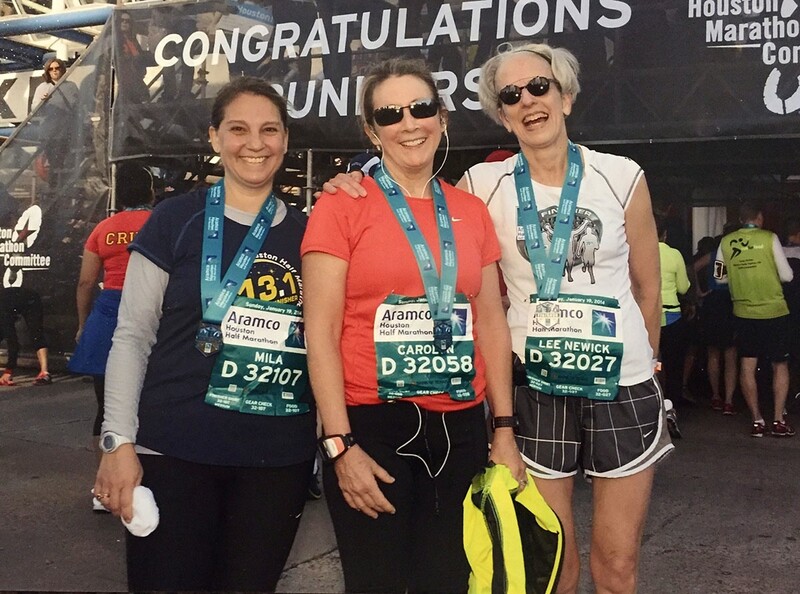 Friends (from left) Mila Neal, Carolyn Galfione and Lee Newick, pictured at the 2014 Half Marathon, have been running together since 2001. Between the three of them, they have run in 41 Houston Marathon and Half Marathon events. They are taking the year off from running the 2019 Houston Marathon, but look forward to the 2020 race. Congrats to all Legacy runners and the thousands of other marathon runners in H-Town this weekend getting it done mile by mile. We’ll be cheering you on! See a complete list of Houston Marathon and Half Marathon 5-9 Year Finishers and Legacy runners here and results from the marathon here.